Justin Bieber is devastated as his monkey, Mally, remains in quarantine. Hollywood, CA — With his bad press about arriving late at a London concert and being booed, fighting with paparazzi, and spitting on a neighbor, pop mogul Justin Bieber is having a rough time. To top it all off, German Customs Agents are still holding Bieber’s Capuchin monkey Mally under state arrest. Sources closest to Bieber say he’s never been so upset. 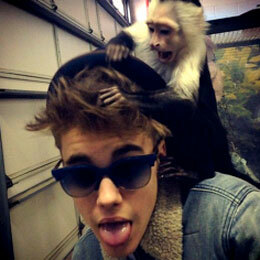 Even though Justin Bieber is devastated that he is monkey-less, his creativity level is at an all time high. He is currently working on a new single titled, “Monkey.” The song is very similar to his break out hit “Baby” and Justin will once again collaborate with Ludacris. “Yo, ‘Monkey’ gon’ be off da chain. You thought Biebs was hot before you ain’t heard nothin’ yet. This single gonna be so good it’s ridiculous; laughable; provoking or deserving of derision… I don’t know a word for that but it’s gon’ be good,” Ludacris stated. If you have any questions or concerns about Justin Bieber’s monkey, or if you would like to cheer up Justin in his time of need, please call the 24-Hour Justin Bieber Monkey Hotline. Mr. Bieber has specifically stated he will only talk to fans about subjects related to his monkey so if you plan on calling to chat about anything besides Mally, do not even try it. It will just make Justin Bieber more sad than he already is. FREE MALLY THE MONKEY! We love you Justin!!!!!!! Question this, just how did said monkey Mally get marijuana??? My heart cries out to Mally being separated from Justin!!! !